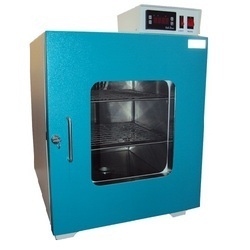 Leading Manufacturer of laboratory vacuum ovens, laboratory incubators, cooling incubators, bacteriological incubators, bod incubators and laboratory blast freezers from Chennai. We feel immensely pleased to offer an excellent quality Laboratory Vacuum Ovens. Our provided vacuum ovens are extensively used in scientific research organization, industrial & mining enterprises, professional institutions and other organization. 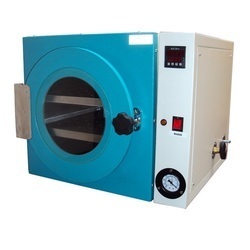 This vacuum oven is designed to provide an excellent vacuum and temperature performing device with safety of the user. Also, offered vacuum oven is tested by our quality controllers against diverse parameters so as to dispatch a defect-free range. Refrigeration system with hermetically sealed EMERSON make compressor. Fin & Tube type air-cooled condenser. Polished 304 Grade Stainless Steel inner Chamber. Magnetic gasket, handle, lock for door. Heater for control of temperature and above ambient operations. Illumination by low wattage lamp. Being a quality oriented organisation, we are able to offer a premium quality Bacteriological Incubators which are featured with a three-fold wall. These bacteriological incubators are used in various chemical plants and laboratories for keeping different items safe and preserved for a long period of time. Our respected customers can avail these bacteriological incubators in numerous specifications according to the demands of customers. We specialize in manufacturing, exporting and supplying a wide range of BOD Incubators. These are engineered using best available technologies and following world class standards. Owing to its rugged construction, high functional efficiency and user friendly operations, these BOD Incubators are extensively recommended by various numbers of clients. One can avail these in various technical specifications. Since our inception, we have become the notable manufacturer, exporter and supplier of an excellent quality Laboratory Blast Freezers that are best for storing food items as these machines minimize the bacterial growth and increase the product shelf life. Our provided blast freezers are available in varied specifications according to the needs of customers. 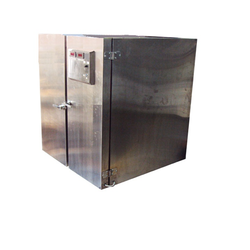 This blast freezer is equipped with all the required functionalities and components. 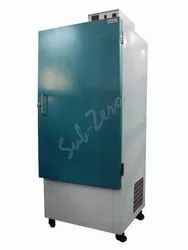 Also, offered blast freezer is used in cold stores and other industries for cooling purpose.